Karachi city is known as the primary industrial hub of Pakistan and also the most populated city. The reason is that the city provides all the life facilities including education, health facilities, job services, recreational facilities and an improved and better living standard. Lania Arcadia is a marvellous residential project in Karachi which has been designed with modern architectural techniques and a high-quality earthquake resilient structure. It is an outstanding blend of beauty, innovation, and quality, and offering highly architected and modern apartments with all the contemporary necessities of life. The individuals and families from areas of the country have now started migrating toward the city to avail a standard living style and modern facilities. This cause the need of accommodation facilities in the city so the renowned Ghani Builders & Developers has provided the solution to this problem by initiating a grand apartment project with the name Lania Arcadia. This place is a comfortable and convenient addition to the real estate sector of Karachi city that will be fulfilling the residential needs of the growing population of Karachi City. The project is providing incredibly designed apartments of different sizes at affordable rates. You will find this place a perfect and outstanding living solution where the facilities are numberless. It is a very well established project which combines all the attractive and important features of an ideal living place. The building of Lania Arcadia consists of 10 floors and a ground floor which has been reserved for parking. The entire project is offering classy and outstandingly designed apartments of 5 and 6 bedrooms which have been featured with all the modern day amenities of life. Living would be a really amazing and memorable experience in these lavish and deluxe apartments. 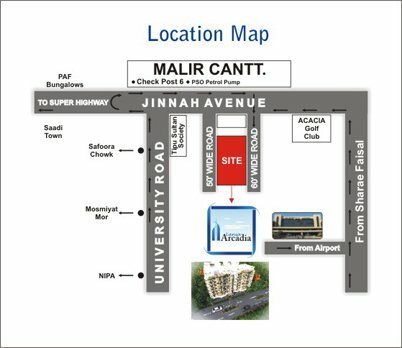 The project Lania Heights is located at the prime location of Karachi at Malir Cantt Area near Jinnah Avenue, Karachi. The project is situated at the distance of few minutes’ drives from Shahra-e-Faisal, Jinnah International Airport, and Kazimabad. Lania Arcadia Is located at the beautiful and frequent location of Karachi. It is a perfect location to live as all the facilities and important roads are closely available to you. You will enjoy great connectivity to the city’s main attractions. It is a perfect location in every way. Many residential and commercial developments have been done in this area while many are still going on. This place is becoming a very active residential and commercial and people are keenly interested to buy properties here. The value and demand of such locations are always high and same is the case with the location of Lania Arcadia. You will find the location and the surroundings favourable and perfect to live with comforts and conveniences all the time. It is a place which enjoys great proximity to the important education centers, hospitals, banks, commercial facilities, transportation spots and job opportunities. The address of this project is one of the most sought after locations of Karachi where you will find an opportunity to live in the womb of comforts. The project consists of a multi-storey building containing 10 residential floors and a ground floor for Parking Purposes. Lania Arcadia is offering a wide range of beautifully constructed apartments of 5 bed and 6 bedrooms. The booking of apartments is open now and can be made on both cash and installment basis. This place provides an opportunity for all people to indulge in luxuries and facilities while following a very affordable payment plan. You will love to live here for so many reasons among which the affordability stands prominent. It is very convenient for people to buy an apartment here either on full payment or on easy instalment policies. All the prices and policies are very appealingly designed and planned by the developers according to the needs and desires of people. Here you will be able to live highly with new standards of living without being troubled about high prices as it is common problem for many people. The booking can be made with a down payment of 50,000 while the balance amount will be payable in 4 years plan of 42 installments. The detailed payment plan is given below containing all the details and information. Have a look at it! Ghani Builders & Developers have triggered a new awesome apartment project into the biggest industrial city, Karachi. They aim to provide new and unique modes of living to people. High standards and quality are evident in their work. Quality construction and use of best building material with new ideas of development have made this project prior for many people. You will love this place for its high standings in the market and unique development status. Integrity, honesty and hard work are the key factors which have been the most outstanding and best development. The special services and brilliant ideas of developers in this project have made each and everything according to the desire and needs of people. A wide range of services and amenities are available for the people. Living would be a source of comforts and elegance here while global approach makes it an ideal living place for all. Basically, the developers work for the improvement of the people and their lifestyle which is necessary. It is essential to elevate the living standards of people according to global ideas. Ghani Builders understood this thing very well and provide an exclusive living place. Excellent plans, ideas and beautiful designs have made it a desirable place to live with style and class. They work hard and sincerely to provide wellness, management and good quality so that people can lead a significant and desired life. This project has a devastating effect on the real estate market and will also have an effect on the lives of people who choose this place as their residence. This project is superbly and masterly designed living place where you will find an incredible range of services and life amenities. It is important to have facilities and features around you to live in an ideal way in its true sense. In the modern time, it is not enough to just have a roof over the head. The lifestyle of people will elevate and improve with the high-class development and availability of enormous features and facilities. Lania Arcadia Karachi is a thoughtfully designed project which caters to the needs of people. It is packed with all the important and crucial amenities that your dream home must have. The list of them is given below for you! It is important to choose a place with a promising location, modern approach and reputed builders. Lania Arcadia Karachi provides you all this and many more. Ideal lifestyle according to the contemporary needs and demands is available to people here. This residential complex provides the best architectural apartments with a maximum range of amenities and facilities. This place is providing the best living conditions to you will definitely find a dream lifestyle for you and your family.